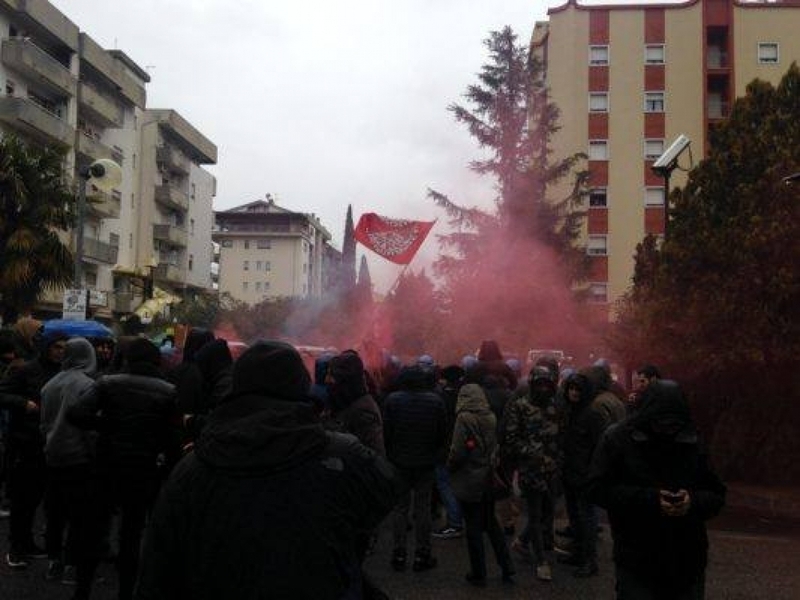 From Macerata to Piacenza: antifas are unwilling to delegate, and counter-attack! 13 Febbraio 2018 | in English. Last week in Italy there was a strong antifascist reaction in the streets of dozens of cities after the terrorist attack in Macerata (Marche) by Luca Traini, a Lega xenophobic party militant who shot and injured six black-skin people as a kind of vigilante revenge against other crimes occurred there. With rampant media overexposure of far-rightist messages also by traditionalist Forza Nuova and neofascist CasaPound parties - in a context where racism and borders are largely deployed by the Government against migrants and poor people - over two hundreds of demonstrations in a week show a way to start a new long-term general struggle against supremacism and fascist ideology in the crisis. Here is the translation of our statement about the demonstrations all over the country last Saturday. Tens of thousands of people filled the streets of Macerata on Saturday afternoon, in a mass demonstration in response to Lega party terrorism. Meanwhile in Piacenza the antifascist square clashed with the police deployed in defense of the local headquarters of Casapound. At the same time in Cosenza and Milan, too, other mobilizations popped up, respectively against Forza Nuova demonstrations and in support of Macerata. The thirty thousand demonstrators in Macerata expressed, in addition to the solidarity with the people who were injured by Traini, a strong political rejection of the diktats of the [Minister of the Interior] Minniti, of its democratic racism, without being intimidated by the repression threatened by the Minister of the Lagers. Macerata was reached from all Italy by tens of thousands of people, including the rebel sections of those associations whose leadership is increasingly crushed by their own subservience to the Democratic Party. The mass anti-Lega character of the Marche demonstration was a breath of fresh air for the country's anti-racist struggles, and a slap in the face of institutional arrogance. The two thousands of Piacenza strongly answered the idea that, in front of fascist rooting, people should respond with silence, toning down and maintaining social peace. In the face of lower attendance, the radicality of clash and militant antifascist practice was greater. The demonstration managed to seize the right of taking militant antifascism in the city downtown head-on, after harsh clashes with police forces deployed in defense of the fascists. The antagonist Emilia-Romagna showdown last Saturday inflicted a strong blow to the hopes of the Lega and fascist right-wingers of being able to take root in the territory with impunity. The message of Saturday is that fascist and Lega terrorism can be countered by filling the squares and using the club, opening and entrenching paths of social struggle, clearing the streets from this scum. And no matter what the bleeding heart liberals say, as they boycott the grassroots demonstrations while they prepare new self-referential gatherings, devoid of any desire of really affecting the entrenchment drives of Salvini (Lega), Di Stefano (Casa Pound) and Fiore (Forza Nuova). The supremacist ideology of the national preference is a tough enemy to beat, in a context where big business, every political institution and the mainstream media feed xenophobic rethorics in order to continue ruling and exploiting through fear and creation of scapegoats; to the point of reclaiming attempted massacres, based only on the color of the skin. In spite of this, last Saturday straightened out the availability of large parts of society to react against the barbarity of black and green [In this context, being the former color associated with fascism and the latter with Lega - TN] terrorism. From now it is up to everyone to deepen the healthy anti-fascist practice and entrench social struggles on the territories.